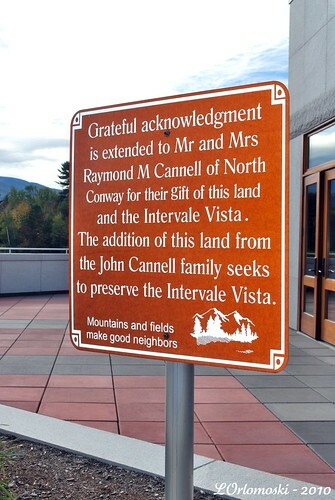 Before I get to that lovely covered bridge that I hinted at in Thursday's post I guess I should back up a bit to the beginning of our recent trip to New Hampshire and Maine. After all, I don't want to leave anything out though that means I'm going to be writing about the trip for a good number of posts! Good thing we were only gone five days, eh? Anyhow, to back up to Tuesday, October 5th ... the day didn't exactly dawn bright and sunny but more like overcast and blah but that's okay, a vacation is a vacation and I don't mind overcast; pouring rain is a completely different story but at least I don't get to that until later on in the trip! Jamie and I packed up the car, patted Tesla good-bye on the head and told him to behave for Andrew, then drove up to Canterbury to pick up my mother. By 9:45 we were on the road heading north and the traffic wasn't bad at all even through Lowell, Massachusetts which can be a real bugger - right, Lois? 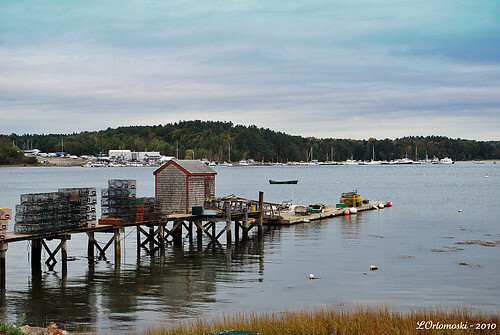 Our route of travel took us right through Portsmouth, New Hampshire where I had the extreme pleasure of living for about two years way back in the early 1970's when my Dad was stationed at Pease Air Force Base. It was Dad's last duty station before he retired in 1974 and probably my very favorite next to Cannon Air Force Base in Clovis, New Mexico. Unfortunately, Pease was one of the very first bases closed during the Clinton Administration's military downsizing but whenever I'm up in that area, I have lots and lots of memories of my first two years of high school and the good times I had while living there. Fortunately, one of our favorite restaurants is still there so we made sure to stop at Newick's Lobster House in Dover on the Great Bay for lunch. 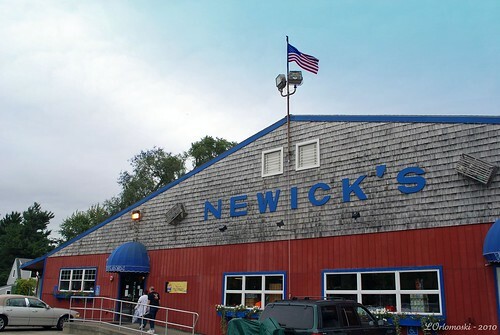 Newick's has two locations in New Hampshire and one in Maine, too, but the restaurant in Dover was the original location to open in 1948. The current building is not the original one as that one was destroyed in a fire; that building was a lot smaller than the current one which is huge by anyone's standards. It needs to be huge, though, as lots and lots of people go to Newick's as the food is fantastic, the prices are quite reasonable, and I've never met a member of the wait-staff who wasn't friendly and helpful. For some reason, I didn't bring my camera into the restaurant with us (probably to save my mother from having to roll her eyes!) so I don't have any pictures of the inside or of our delicious lunches - next trip up, maybe? My cousin and I usually try to go to New Hampshire for some tax-free Christmas shopping and Newick's is always on the agenda so it's not like I'll never get there again! At any rate, I had my usual as I'm a creature of habit and I just love, love, love their swordfish nuggets which I've never seen anywhere else and are to die for. Basically the nuggets are chunks of delicious swordfish steak that are lightly battered and deep-fried just like the baby shrimp that I always pair them up with; served with a side of french fries and coleslaw it just doesn't get much better than that unless you want to add on a bowl of Newick's delicious clam chowder! Dang ... I'm definitely going to have to talk to Amy about a trip up soon! After that it was back in the car to continue our drive north up New Hampshire Route 16 towards our destination for the night about 80 miles away: Jackson, New Hampshire. The skies had cleared up rather nicely once we got north of Dover and there was some pretty foliage though the color was nowhere near peak. As we passed through Conway Village I just happened to look over and caught sight of a covered bridge which prompted me to quickly pull down a side road, do a U-turn, and stop. Neither Jamie nor my mother seemed overly surprised! 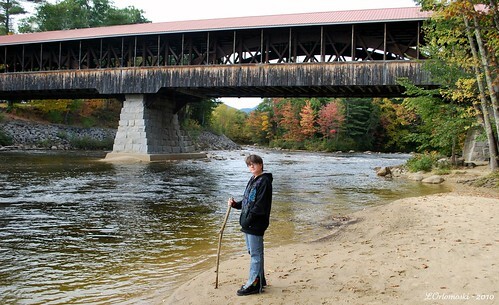 This is the Saco River Bridge even though it spans the Swift River - I think! It's a bit confusing as depending on what literature you're reading, some say that the bridge carries East Side Road (old Route 16) over the Swift River and others say that it's over the Saco River. Huh? 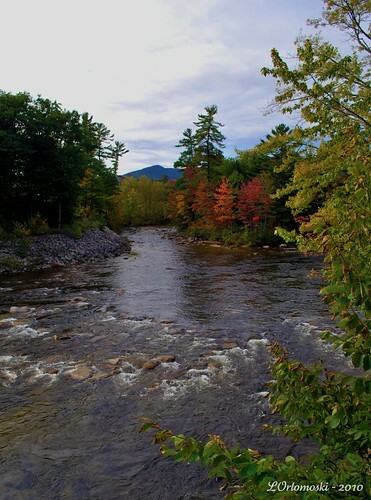 Maybe it's because the Swift River is a tributary of the Saco River? 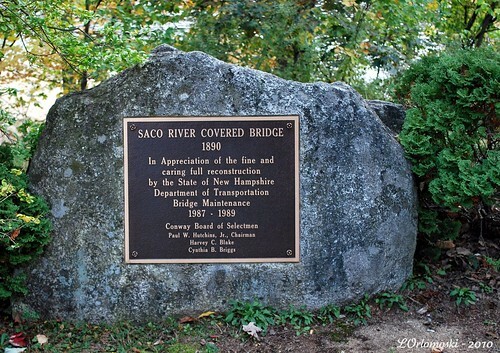 Well, either way, there's no doubt that the bridge is called the Saco River Bridge! 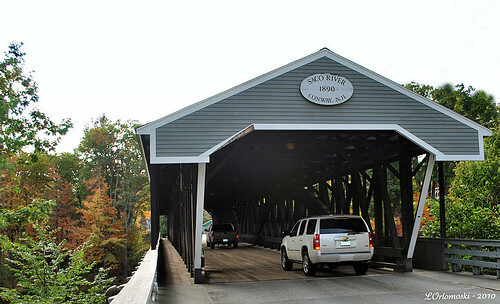 The Saco River Bridge is #48 of New Hampshire's fifty-four historic covered bridges. The current bridge was built in 1890 by Charles Broughton and his son Frank and is the third covered bridge to stand at this site. In the 1850s, Jacob Berry and Peter Paddleford built a covered bridge that replaced a crudely framed log bridge that had collapsed. 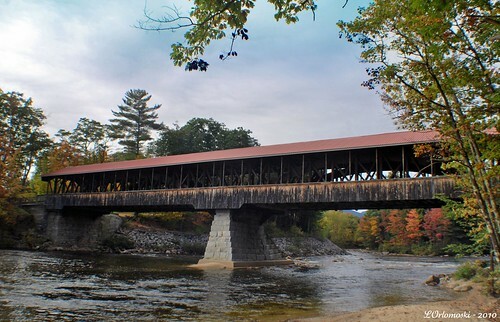 That bridge stood until the Swift River Covered Bridge crashed into it in 1869 at which time the Saco River Covered Bridge was rebuilt but it was destroyed again by a tannery fire in 1890. It was at that time that the Broughtons once again rebuilt the bridge at a cost of $4,000. As for the technical details, the covered portion of the bridge is 224'-9" long - made up of two spans that are 103-'4" and 95'-4". The overall width is 30'-4" with a roadway width of 18'-3". 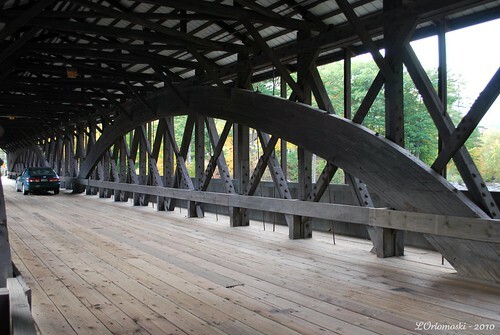 The style of the bridge is a Paddleford truss with added arches, a style that is only found in New England and which was originated by Peter Paddleford of Littleton, New Hampshire in 1846. 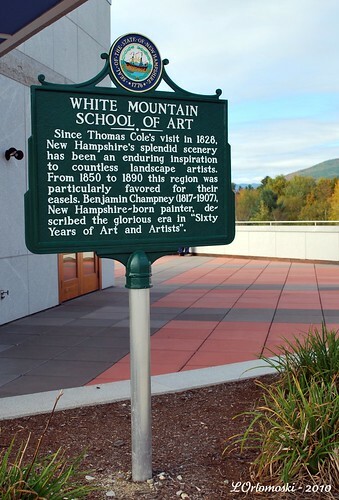 The design was actually a redesign of the Long truss which was designed and patented by Colonel Stephen Long in 1830. 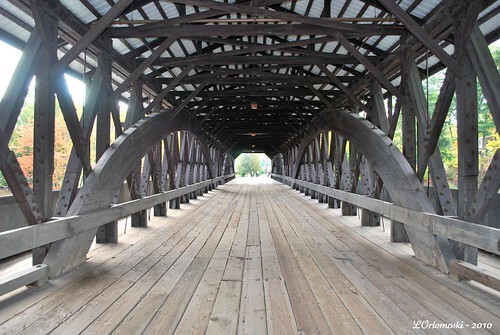 Paddleford was never able to get a patent on his design because of court challenges by the holders of the patent for the Long truss as the designs were very similar but Paddleford's design was widely used throughout New Hampshire as well as on a couple of bridges in Vermont. As you can see, the truss design looks very sturdy and considering the bridge has been standing strong since 1890, I'd have to say that Mr. Paddleford knew exactly what he was doing! The shot above was a little tricky to get as there's quite a bit of traffic that crosses over the bridge but I managed to catch a short lull in that traffic to plant myself front and center and shoot quickly! 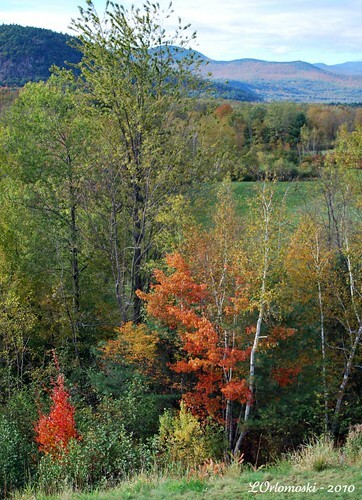 The view from the bridge was quite lovely with the White Mountains to the east and a bit of fall foliage to add some color to the scene. If you walk down a short path near the parking area, there's a small beach on the banks of the river almost under the bridge which looked like the perfect spot to go cool off on a hot summer day - though it definitely wasn't that kind of day while we were there! Even though it was going to put us going back the way we came, I just had to drive over the bridge before we started back towards Jackson! There's just something about the sound of one's tires as you drive over the planks that you can't find anywhere else! There's a visitor's center located here so we stopped so that I could take some pictures and we could grab some brochures and maps. 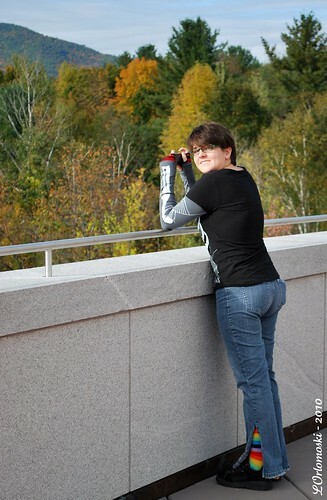 Jamie took some time to enjoy the view, too! 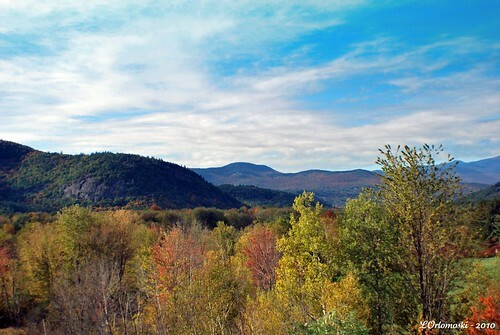 While we were at the Intervale Scenic Area, there was one gentleman there with an easel and canvas who was painting the beautiful scenery in front of us and with a view like this, who could blame him? However, you're just going to have to wait a little longer for that story as it takes time to edit all these pictures! 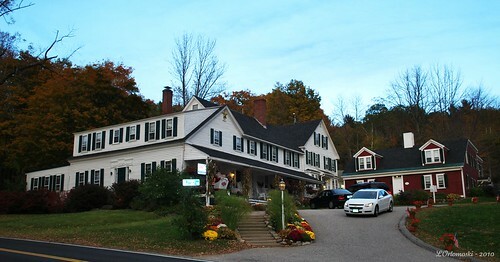 That Christmas Farm Inn looks absolutely charming and quite enchanting! 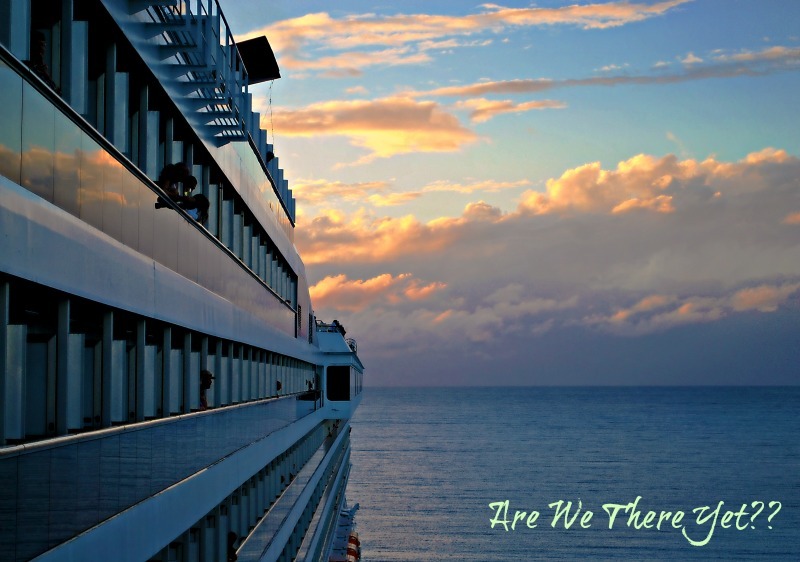 So far, your trip looks and sounds fabulous! And now I'm hungry! You took some beautiful shots, as always, Linda! I love the one of Jamie in front of the bridge. that pic with Jaime and the color in the background is fabulous! Awesome covered bridge. Full fall colors! just beautiful, and the new header too! The pictures are absolutely stunning. I love this time of year. Love all the shots and cane relate to the sound of the tires on a covered bridge. Love your new header and background too. Awesome. The bridges vare a real tourisdt spot. Ahhh, you're making me homesick, Linda. I did get a nice big lobster roll at Newick's over the summer, though, but I didn't make it up north. Wonderful time of year to be there. I want chowdah! The bridge is cool, I'm amazed by that curved wood piece part. I know that's tough to do. While the colors weren't in peak, it's still pretty good! 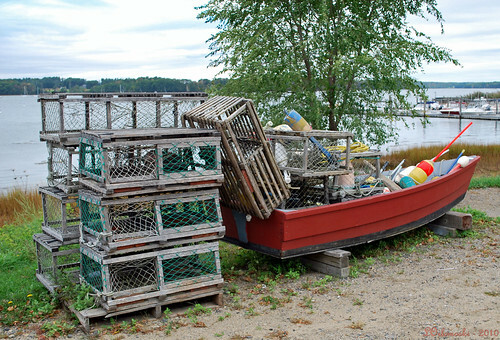 And I really liked the shot with the lobstah boat and traps. Good still live. I think I'm learning why I hate fall: It's because I live in a $%@$(%! @#* desert and things just go from brown to browner! The color is just overwhelming. Can't wait to see more! Love, love the new header and background. Just love it! And Newick's? We've been there MANY times, even camped in their parking lot a couple of years ago, with their permission, of course, and after purchasing some fine chowdah for our lunch the next day. Good memories. Hey Linda! this is se7en from Blogs Gone Wild. Great photos, looks like you guys had a lot of fun! 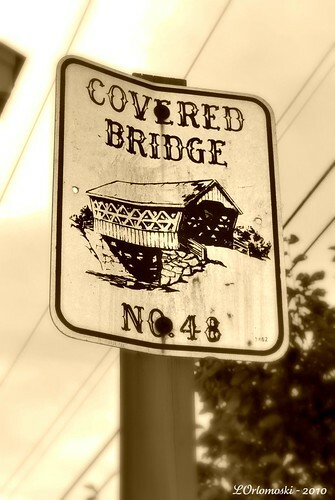 Love that covered bridge. I'm following you on Twitter, my user name is @blogsgonewild I'm getting my website up and running again and I think I'm gonna start blogging again over at evil-se7en.com =) Great to see that you're still blogging.